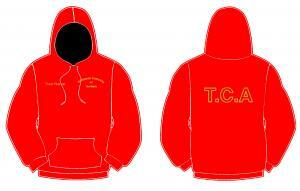 Red hoody with contrast black inner hood and full length zip. Tavistock Company of Archers logo embroidered on left chest, optional personalisation embroidered on right chest. "T.C.A" embroidered on back in gold.